The Retina I LED Fixture from Hydra Aquatics is a perfect choice for frameless (rimless) aquariums, with up to 8mm glass. Used both in freshwater and saltwater setups, the 9500K spectrum is viewed as a very crisp and clean white. Over 50W are drawn by a combination of 12 white and 8 blue LEDs. 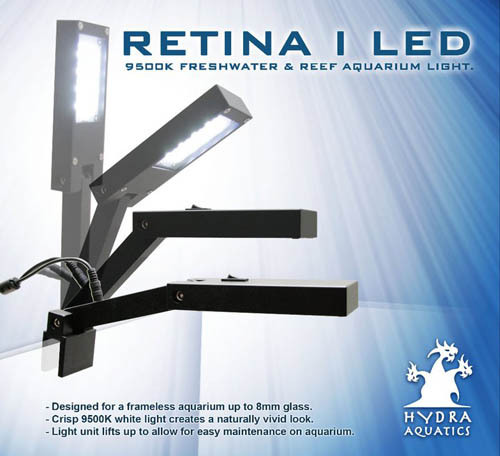 The Retina I LED is currently available at Marine Depot and is selling for $99.99. The fixture can easily be removed when performing maintenance on the aquarium, so no more excuses! We are happy to see more and more LED fixtures showing up on the market. This gives hobbyists more choices, and manufacturers a reason to improve their products. Thanks for sharing the news about this LED light fixture. FYI this is not a 50 watt LED fixture. Received mine tonight and it only showed 8 watts on my Killerwatt meter. Marine Depot admitted on the phone that the chips were only 3/4 watt each and that the light output was “equivalent” to 50 watts, of incandescent apparently. They also denied the advertising was deceptive and claimed it came directly from the manufacturer, thereby denying any responsibility. I got an RMA from them but they are making me pay for shipping.